U-shaped raised beds offer great accessibility and efficient use of growing space. A large U-shaped planter creates a wrap-around garden design with center pathway, ideal for wheelchair access. 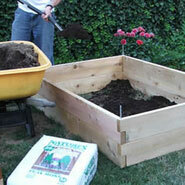 U-shaped garden beds are cost-effective, providing more growing space with less material costs. 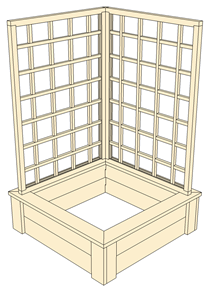 They work well with matching garden trellises, to enclose an area with flowering vines, fruits and vegetables. Trim pack options are available for any size planter, for added durability and an attractive finish. Planter bottom options are also available, to provide adequate soil drainage for gardens on patios, driveways and rooftops. Raised bed planters are made from durable cedar wood, protected by a non-toxic waterproof sealant that is safe for vegetable gardens. Many shapes and sizes are available, including custom raised planters. Let us know what you're looking for. We'll help you plan the perfect garden.